In addition to this, by the end of the 11th century, two of the largest Saxon settlement areas had been demolished to make way for the Castle and Cathedral precincts. At the same time, a rebellion in 1075, and others in the 1090s paint a chaotic picture. However, this should be taken in context of the growth in churches, as well as the increased trade and employment opportunities brought about by the construction of the Castle, Church and the establishment of the Market. <?xml:namespace prefix = st1 ns = "urn:schemas-microsoft-com:office:smarttags" />Norwich Castle. Courtesy of Norfolk County Council Library and Information Service. Construction of the Castle (NHER 429) had begun by the end of the 1060s under William I, probably originally as an earthwork and timber fortification. By 1075 it was defensible, and it grew in size until between 1095 and 1110 when a stone-faced keep was constructed. During the 12th and 13th centuries further structures, including the south gate and another possible gatehouse were added to the site. The bridge to the mound (NHER 874) was also repaired during 1170, making it an older structure than the keep. Using similar facing-stone, imported from Normandy and Northamptonshire, the Cathedral (NHER 226) was begun in 1096 and finished by the 1140s. It stands within a walled precinct (NHER 377), also laid out at this time, and stone was brought to the site up a canal from the Pull’s Ferry Watergate (NHER 26053) on the River Wensum to the east. Associated with Cathedral are the former Bishop’s Palace (NHER 26035), now a school and dating to the 11th century, as well as the 13th century Deanery (NHER 26075). The precinct wall itself survives (NHER 26039), along with the Bishops’ Gate (NHER 26034), Erpingham Gate (NHER 26083), and St Ethelbert’s Gate (NHER 558). The other great foundation of the Norman period is the Market Place (NHER 40773), around which the French Borough was established in the late 11th century. It is thought that this land was previously common land for the Anglo-Scandinavian residents of Norwich, and the establishment of this kind of borough is paralleled only in Nottingham. Other known medieval markets include one on All Saints Green (NHER 375) and a horse market at St Stephen’s Plain (NHER 376). During the 13th century, the monastic establishment at the Cathedral was joined by the Greyfriars (NHER 373), Austin friars (NHER 374), Whitefriars (NHER 430), and the Blackfriars (NHER 381, NHER 428), who owned precincts across the city, as well as the Carrow Priory (NHER 296), founded in the 12th century, outside the walls. All of these monastic establishments are known to have contained extensive buildings, but all but one precinct were largely destroyed. The most extensive remaining buildings are those of Blackfriars (NHER 194), at the top of Elm Hill, which represent the most complete friary structures in the country. They were purchased by the City in 1538 and put to use as a Public Hall, and remain so even now. In recent years both the Franciscan (NHER 373) and Carmelite (NHER 234 and 26598) sites have been subject to archaeological excavations. By the end of the 13th century, construction of the city walls (NHER 384) had begun, although these weren’t finished until 1343 when Richard Spynk, a wealthy private citizen, paid for the final stretches. The walls, gates and the associated towers all survived in various forms for nearly five hundred years, although the twelve gates were pulled down in a concerted effort between 1791 and 1810. Limited parts of the walls survive around Magpie Road, Barrack Street (NHER 388, NHER 819), Carrow Hill and Chapelfield. 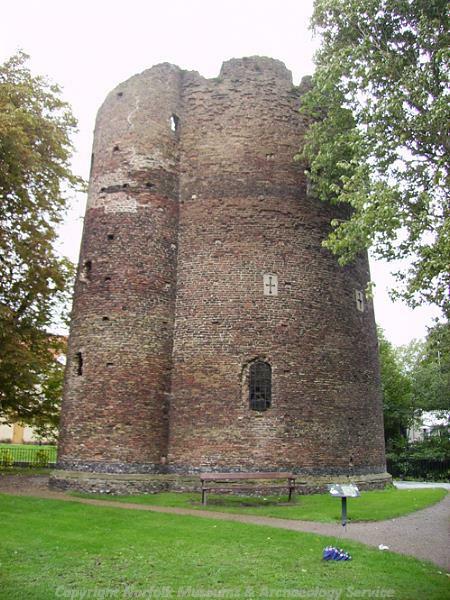 Surviving towers include the Black Tower, which was part of the wall, and the Boom Towers that guarded the Wensum near Carrow Bridge. 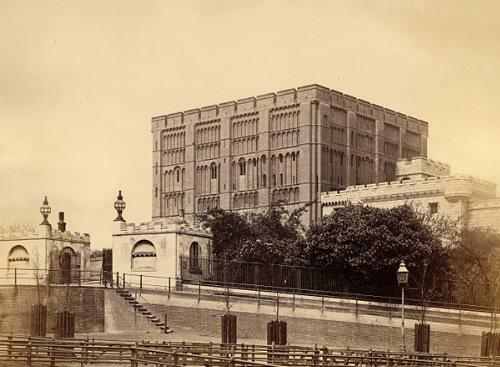 The sites of the gates are known and include St Benedict’s or Bennets Gate (NHER 151, NHER 26166), Brazen Gate (NHER 26016), Heigham Gate (NHER 26127), St Augustine’s Gate (NHER 26160), St Giles Gate (NHER 26171), St Martin’s Gate (NHER 26172), St Stephen’s Gate (NHER 26173), and Ber Street Gate (NHER 384). Also part of the city defences, although separate to the wall, is Cow Tower (NHER 632), a freestanding artillery tower built in the late 14th century. The city bridges were also an important part of the city structure, and their sites have remained largely unchanged since this period. These included timber structures at Fyebridge (NHER 62), and St Miles or Coslany Bridge (NHER 614), and Bishops Bridge (NHER 617), which the 18th century had a gate (NHER 26015) over it. Bridges were particularly important to link the banks around the Fishergate and Oak Street areas, where excavation has retrieved evidence of industrial activity during this period, as well as quaysides (NHER 26406) and warehousing to the city centre. Industry in the city appears to have been broad, including copper alloy working (NHER 868), iron working (NHER 281, NHER 284), horn working (NHER 166), bell casting (NHER 156), and animal processing and tanning (NHER 26525, NHER 26535, NHER 37411). Mention should also be made of the chalk and flint mining (NHER 389, NHER 392), which took place during this period, as well as the associated limekilns (NHER 294, NHER 642, NHER 26407). Fine examples of painted glass produced during this period also survive in the Church of St Peter Mancroft (NHER 257) and the Guildhall (NHER 657). During the medieval period wealth created by the wool trade appears to have been the basis for the large merchants’ houses that sprung up in the mid and late medieval periods. Of particular importance during this period was the King Street area, which contained wharfs, quays (NHER 26406) and warehouses for receiving goods, as well a number of large houses or showrooms. During the 15th/early 16th century many of Norfolk’s, and some of England’s, best known families had houses here; the Pastons, Cokes, Boleyns, Howards, Hobarts and Berneys. Surviving houses from this period include 12th-century Music House (NHER 604), as well as Dragon Hall (NHER 449). The latter is a 15th-century timber-framed structure, largely constructed in the 15th century by Robert Toppes, one of the city’s greatest merchants. It gains its name from the fine carved dragon spandrel preserved in the interior, and it is likely to have been used as an opulent showroom for wool products. Other houses of note can be found across the centre of the city, including late 15th century Suckling House (NHER 605), currently under renovation and the home of Cinema City. The café bar occupies a timber-framed house of 1480 that luckily survived the fire of 1507 which wiped out much of earlier housing in the centre of Norwich. Also surviving is Stranger’s Hall (NHER 606), now open to the public as a museum, which began life in early 14th century. It gains its name from occupation by Walloon weavers (referred to as ‘strangers’ by the local community) in the late medieval and early post medieval period. Dating to the 15th century are Pykerell House (NHER 136), Odd Nos 69 to 89 Duke Street (NHER 331), and The Great Hall (NHER 790) all of which were designed as high-status housing. The Guildhall (NHER 657) is one of the few survivng public buildings from this period, situated on one side of the marketplace, and was built as the guildhall of St George's Company between 1407 and 1413. A large part of this building is viewable by the public, as the 16th century King of Hearts buildings. The wealth that funded these buildings was also used for more public displays in the form of churches; the exact number is still unknown but is likely to be over sixty. To this day, and despite the depradations of the Reformation, Norwich still has more medieval churches than any other city in Western Europe north of the Alps. One of particular interest is the church of St Julian (NHER 572), the site of the anchorage of the medieval female mystic Julian of Norwich, who received a series of visions that she published as the first book in English Language to be written by a woman, around 1393. Also of interest is the Great Hospital, situated just to the east of the Cathedral, and founded by Bishop Walter de Suffield with the church of St Helen subsumed within the foundation which was dedicated to St Giles (NHER 588). Set within a large precinct (NHER 624), to this day it still continues its purpose as a residential home for the elderly. Although not usually open to the public a stunning blue ceiling with 252 painted spread eagles, built in honour of Anne of Bohemia in 1383, can be seen in the Eagle Ward during the occasional open days. A number of other hospitals were established, including what is now the Lazar House (NHER 631), as well as St Saviours’ Hospital (NHER 26326) and St Paul’s hospital (NHER 379).